When author and dog fosterer Della Galton went on holiday to the Greek island of Rhodes for a family wedding little did she know it would be the start of a love affair with a difference. During the holiday Della found herself drawn to a stray dog living rough among the rocks on the beach. A closer investigation revealed the animal was scavenging from the holidaymakers to feed her 13 puppies. With the resort about to close for winter, dog lover Della knew she couldn’t leave the canine family to starve. So began an adventure that would see Della the Dorset dog rescuer take on the greatest canine challenge of her life. She found herself caught up in a major dog rescue to rehome the 13 puppies and save mum from death row by bringing her back to live with her and her family of foster dogs. Once in the UK, her adventures began and over the years Lindy proved to be a dog with nine lives overcoming many illnesses and “accidents” which cost Della more than £6,000 in quarantine and vet’s bills. 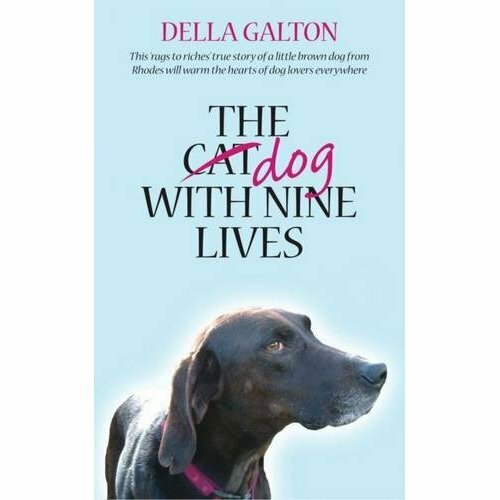 The Dog with Nine Lives is the extraordinary story of how Della spent £6,000 of her savings to give a death-row dog from Greece a new life in Britain. When I was offered this book to review I was really happy because I love reading about special dogs, and Lindy, the dog at the heart of this delightful story is certainly special. It’s not just about special dogs, Della and her family are obviously very special people and care very deeply about dogs. This is a brilliantly written, heart warming tale that I just couldn’t put down. You get drawn into the story and just can’t help but fall in love with courageous Lindy and her fellow rescue dogs. As the title suggests Lindy went through many scrapes during her life with Della and battled everything from cancer to stampeding cows. It is written with warmth and compassion and Della has managed to achieve a perfect balance of humour and sentimentality. There were times I laughed out loud at Lindy’s antics and others when I shed more than a few tears. This is quite a short book and is easy to read, it flows beautifully. There are also some lovely colour photos showing the progress Lindy made after her rescue, and of her equally gorgeous doggy friends. I highly recommend this book; it’s a must for all animal lovers and would make a great gift or stocking filler (after all Christmas is getting scarily close! ).